A flyer on the seventh volume of Mahoutsukai no Yome manga has revealed on Friday that the series will receive a TV anime to premiere in Fall 2017. An official website has opened and announced that the series will run for two cours, and will be released in four Blu-ray volumes between November 2017 and July 2018. Staff and cast members will be reprising their roles. 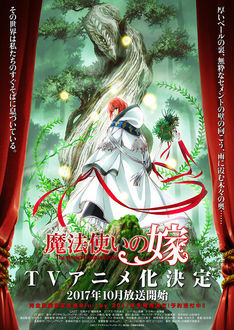 Mahoutsukai no Yome is drawn by Kore Yamazaki, and began publishing in Comic Blade in November 2013 before transferring to Comic Garden in September 2014. The manga placed second in the 2015 Kono Manga ga Sugoi! (This Manga is Amazing!) rankings among male readers and 16th in the 2016 rankings. It was also nominated in the 8th Manga Taisho awards. The series has inspired a three-episode prequel OVA that premiered between September 2016 and September 2017. Can't wait thank you so much!!! This is the best news of this year yet!!! The manga was amazing and I cannot wait for it to progress farther and farther and this will definitely give me something to do to recap moments and see how they look in motion rather than in picture. I cannot wait for this I have a feeling it will be one of those shows that I watch over and over. It's about time, too! One of my favourite manga and I just saw the second episode of the prequel OVA has been released today. So many of my favourite manga have been/are animated one after the other! Before all those Grand blue needs anime, the manga is already a massive hit in the community for its Gintama/PS type of humour, and an anime adaptation will blow up(it ranked third in most anticipated anime in 2017 poll). Unlikely tho. Not often does anime news make me happy, this did. I feel like an idiot now for saying 2017 couldn't get any better. Nice. I was just thinking back then why this manga does not have TV. Ohh nice, now here's a manga that deserves being animated. Can't wait. I was really hoping this would happen after they started the OVAs and they did! I hope this adaptation gives a good representation of the manga. I can't wait for Fall! I wanna cry. The trailer depicted the world exactly how I pictured it as an anime; from the animation to the colors to the camera work to the music. I can't wait! I knew this was going to be a thing, the manga is glorious and hopefully the anime will be as well. I don't really have the time for anime anymore, but I will certainly watch the adaption of one of my favorites! So glad were getting anime with higher production value. I'm looking forward to watching this. I never got around to reading the manga, but was interested in it on premise alone. Looks pretty interesting actually. Love SoL, and magic theme seems fun. But I highly doubt it will be adapted. They skipped the fantastic Northern Territory Assignment Arc which made me love Shirayuki more but what hurt me more was how the anime ruined my OTP in the manga. This goes without saying that I would have loved to see sequels of Chihayafuru, Akatsuki no Yona and Nijirio Days for examples, because of how they improved tremendously after where their respective anime ended but I have always prepared myself to accept that there shall never be any sequels of any of these. There are some manga that I really adore that never got adaptation in the first place, so just having seen the characters like Shirayuki and co., Yona and co., Chihaya and co. animated seem more than enough (even though it's never enough!). Unlike Chihayafuru, which I started reading after the end of season 2, I actually read all the other manga I have listed way before they were ever announced to have anime adaptations, some of which go back as much as 3-4 years. So, I tend to remain hopeful as long as they are ongoing. Anime adaptation like Koe no Katachi are few and far between out there. YES YES YES I CAN'T BELIEVE IT, IT'S ACTUALLY GETTING AN ANIME!! I am totally okay even if they just make an OVA out of QQ Sweeper. It baffles me how amazing the sequel has been so far, seems like I am reading an entirely different manga, well polished and grandly executed compared to the prequel. Motomi-sensei is amazing. Coming back to the manga in discussion, I wonder how they are gonna make a 2 cour anime out of a manga given the number of chapters available for adaptation. I wonder if they plan to make a chapter and a half per episode. Some chapters are dialogue heavy while the others seem to have hardly any dialogues at all. If they make anything close to the PV that came out before the OVA adaptation, this shall be a grand stand anime. Coupled with an amazing world building and the story that evolves slowly but surely, the most beautiful thing about the anime are the characters and their interactions. I simply cannot wait! To PTW list it goes! Awsome news. Been reading this and loving it so far. It's more slice of life-y magic themed manga with great world-building. The art was also fantastic. Hell yeah ! I'm so happy !